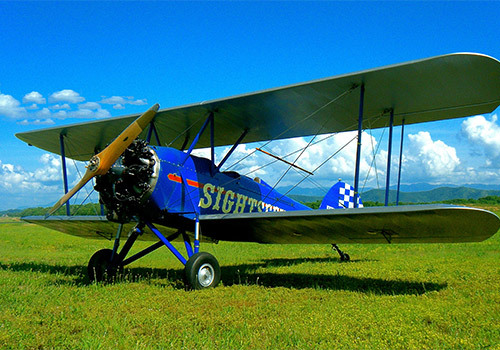 Offering a truly unique experience for any age while visiting the Sevierville area, Sky High Air Tours Biplane Rides offers an adventurous and romantic flight in an open cockpit plane. 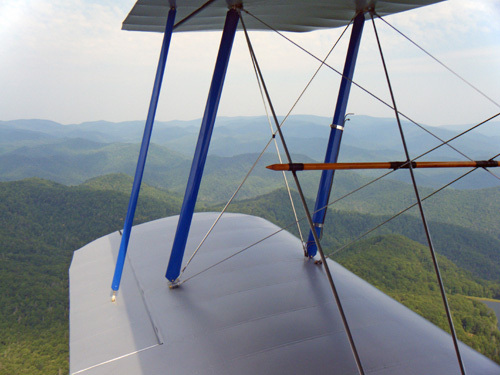 Guests can take a nostalgic trip into yesteryear with an authentic 1927 Waco Biplane, complete with stunning views of the majestic Smoky Mountains and the surrounding area. 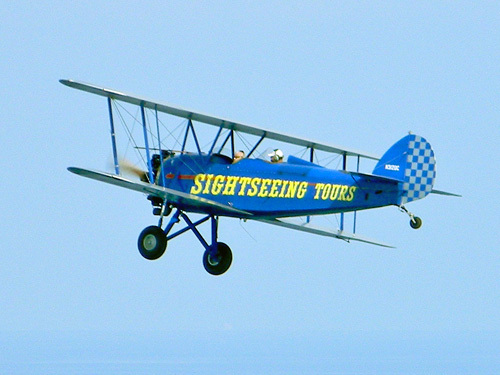 Come fly with us and experience the romance and adventure of flying in an open cockpit biplane! 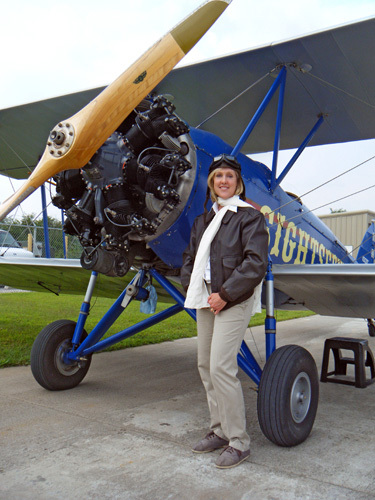 Take a nostalgic flight into yesteryear in an authentic Waco Biplane with a modern day Barnstormer. Breathtaking birds-eye views of the Great Smoky Mountains and the surrounding area provide an incredible photo opportunity. All ages are welcome and two can fly for the price of one, so bring a friend and share the fun. The airplane is a 1927 Waco Model 10 Straightwing, pronounced “Wah-Co” like taco. “Way-Co” is a town in Texas. The experience is like riding in a time machine that takes you back to the Golden Age of Aviation. Where you can touch the fabric that holds you aloft, smell the oil and hear the roar of a radial engine as you fly with the wind blowing through your hair. Unlike an aircraft in a museum, roped off from the public, you can climb aboard this airplane and experience what it was like to be a Barnstormer from a bygone era! What should I wear for my biplane ride? On warm weather days, shorts, t-shirts, and perhaps a light jacket are perfectly fine. During colder seasons, long pants and a warm jacket are highly recommended. Remember, the biplane has an open air cockpit! How many people can fit in a biplane? Our planes fit 2 people on a 32-inch seat. These biplanes also operate on a 400lb maximum. What will happen if it rains or inclement weather occurs on the day of my scheduled flight? We will reschedule your flight to a day with better-forecasted weather. 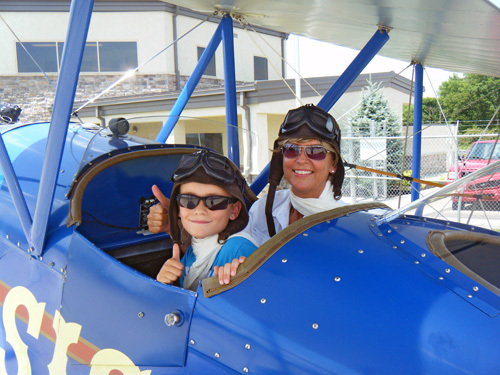 Are children allowed to participate in the biplane rides? Yes. All ages are welcome. What accessibility measures are in place? Some dexterity is required to enter and exit the biplane. We do our best to accommodate all individual needs. Do I have to wear a headset during the flight? Yes. All passengers must wear the provided headsets during the flight. These protect your hearing and allow you to communicate with the pilot at all times. The ride times depend on your chosen biplane flight package. 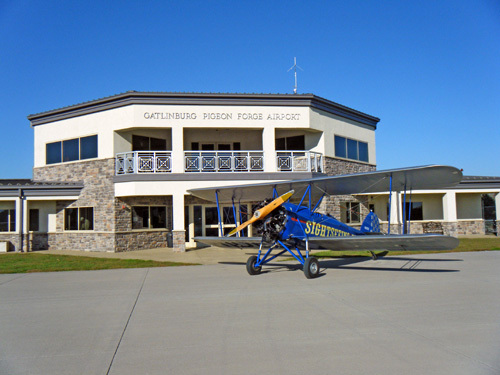 We offer 8, 15, and 30-minute biplane rides.